The food-delivery specialist sank on weak user growth in its third-quarter earnings report. Investors were dumping shares of GrubHub Inc. (NYSE:GRUB) last month after the number of active diners the company reported in its third-quarter earnings report came up short. Shares of the food-delivery specialist finished the month down 11% according to data from S&P Global Market Intelligence. 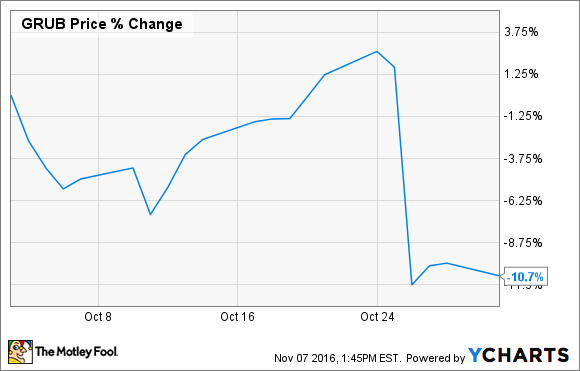 As the chart below shows, the stock plunged after the report came out on October 26. Revenue in the quarter was up 44% to $123.5 million, topping expectations of $118.3 million, while earnings per share jumped 77% to $0.23, beating the consensus at $0.19. CEO Matt Maloney said, "We are pleased with Grubhub's third quarter growth, as we continue building the most comprehensive marketplace for restaurants and takeout diners. Our product improvements and investment in delivery continue to generate high levels of sustainable growth." Despite the 44% increase in revenue, active diners were only up 19% to 7.69 million, while daily average orders hit 267,500. Since user growth is not keeping up with revenue, GrubHub will struggle to maintain the current revenue growth rate, as it's been able to boost the latter by getting current users to spend more. That will only go so far. In order to drive long-term growth, it would be better off attracting more new users. GrubHub's growth and profitability remain strong, but the company is valued at a P/E of 42 based on this year's earnings and operates in a highly competitive industry. The stock has also gained 57% year-to-date, so the post-earnings pullback may have been partly a correction after an impressive run this year. GrubHub management is executing its plan effectively, but if active-diner growth continues to slow, I'd expect more trouble for the stock.